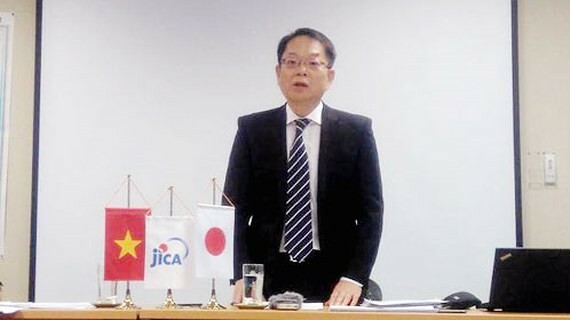 Chairman of Ho Chi Minh City People's Committee Nguyen Thanh Phong on March 17 met Chief Representative of the Japan International Cooperation Agency (JICA) Vietnam office, Fujita Yasuo. 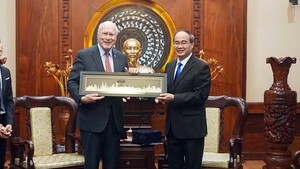 The municipal leader expressed his sincere thanks to the outgoing JICA Vietnam Chief Representative, Yasuo Fujita for supporting Ho Chi Minh City to upgrade urban infrastructure and improve the quality of people's life when he was in the position of Chief Representative of the JICA Vietnam office. Mr. Nguyen Thanh Phong expected that JICA will continue to assist HCM City through official development assistance (ODA) funds and technical service supply for projects of the first metro route Ben Thanh-Suoi Tien and urban flood control. He committed the city’s authorities will solve the difficulties and problems during the Ben Thanh-Suoi Tien metro line project’s implementation process to ensure that the project can go on schedule. The chairman also hoped that Mr.Yasuo Fujita’s successor Tetsuo Konaka will promote projects for its good success between JICA and HCM City. For his part, Mr. Fujita Yasuo expected the local authorities to fulfill their commitment to implementing the Metro Line No1 and water environment projects on schedule.